The development of embryos requires interaction of many endogenous hormones. The aim of the study was to determine which endogenous phytohormones are involved in the process of oat (Avena sativa L.) haploidization. Oat haploids were obtained by wide crossing with Zea mays L. The hormonal profiles of the ovaries with (OE) and without developed embryo (OWE) were compared. Phytohormone contents were measured by UHPLC coupled with mass spectrometer. The total content of indole-3-acetic acid (IAA), trans-zeatin (tZ), and kinetin (KN) in OE was significantly higher than in OWE. 4-Chloroindole-3-acetic acid was detected only in OWE. There were no differences between OE and OWE in the content of gibberellins (GA1, GA3, GA4, GA6, GA7) and stress hormones (abscisic, salicylic, jasmonic acids). Content of endogenous KN was highly negatively correlated with the percentage of haploid embryos, germinated haploid embryos, haploid plants on MS (in vitro), haploid plants in soil (ex vitro), and doubled haploid lines. The tZ content negatively correlated with the frequency of haploid embryo formation, germination, and haploid plants obtained in vitro, as opposed to GA1, which correlated positively. A positive correlation was found between IAA and tZ in OE, whereas in OWE it was a negative correlation. The profiles of phytohormones in OE and OWE were determined; however, their mode of action needs to be clarified. The online version of this article ( https://doi.org/10.1007/s11627-019-09967-5) contains supplementary material, which is available to authorized users. Oat (Avena sativa L.) is one of the most important cereals cultivated by man (FAOSTAT 2017). It is used both in the food industry and the animal nutrition, because it is appreciated for its nutritional value. Progressive environmental changes are forcing breeders to produce new, fertile, and resistant cultivars. Modern plant breeding willingly uses doubled haploids, because they allow to obtain complete homozygosity after one generation and at the same time to shorten the breeding program. Oat is a species recalcitrant to haploidization; however, wide crossing allows to obtain haploid plants. Although practical protocols for producing oat doubled haploid have been described (Rines 2003; Sidhu et al.2006; Marcińska et al.2013; Nowakowska et al.2015), very little is known about the molecular and hormonal mechanisms governing the process of haploidization. Hormonal studies in haploid embryos that require sample destruction have not been reported in literature yet due to the fact that (1) the process of haploidization is still not very efficient, laborious, and time-consuming; (2) extremely low embryo weight hinders the sample preparation and analysis of the biochemical composition; and (3) embryos have great value in the breeding work. To our knowledge, the endogenous hormonal profile of haploid oat embryos obtained by wide crossing with maize has not been established yet. A little more has been done in plant growth regulators (PGRs) in relation to microspore embryogenesis. Hormonal regulation of microspore embryogenesis was thoroughly reviewed by Żur et al. (2015a). However, most of the information concerns the exogenous influence of PGRs on this process. 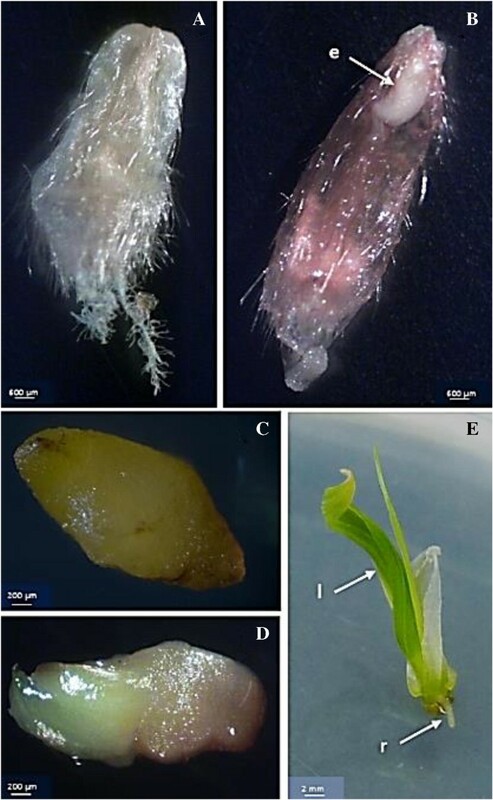 Few articles were devoted to endogenous levels of phytohormones measured in the anthers of tobacco, maize, legume species, and triticale in order to assess their influence on microspore embryogenesis effectiveness (Dollmantel and Reinert 1980; Delalonde and Coumans 1998; Lulsdorf et al.2012; Żur et al.2015b). Only Hays et al. (2001) compared phytohormones in zygotic embryos and haploid embryos of Brassica napus obtained by microsporogenesis and demonstrated that gibberellins GA1, GA20, abscisic acid (ABA), and indole-3-acetic acid (IAA) contents (per embryo cultured) were lower in haploid embryos than in zygotic ones at comparable stages of development. Endogenous hormones in developing zygotic wheat kernels were studied by Hess et al. (2002). High cytokinin concentrations in ovules with a low level of auxin during the initial embryogenesis phase are necessary for the proper embryo development. Subsequently, the level of IAA and ABA in the endosperm of wheat starts to increase sharply during the rapid growth phase to reach the highest point during the soft-dough phase. Cytokinin contents decrease in the endosperm, while in the embryo, they remain at a high level during the rapid growth phase and then drop. Similarly, the accumulation of cytokinins in caryopses in the early period of seed filling (12 d after pollination) of barley and maize was recorded (Powell et al.2013; Rijavec et al.2011). Investigating hormones involved in embryogenesis of haploid embryos is very difficult; hence, our approach to study the endogenous hormone balance was indirect. In this work, we examined the hormonal profile of the ovaries, in which haploid embryos developed (OE) as a result of wide crossing, and compared it to the hormonal profile of the ovaries, in which there were no existing embryos (OWE). The correlation between endogenous phytohormones and the efficiency of oat doubled haploid production was also analyzed. On this basis, we hypothesize if endogenous phytohormones are involved in the process of haploidization regulation. Seeds of Avena sativa L. were obtained from Strzelce Plant Breeding Ltd. The following genotypes were used for wide crossing: STH 4.4729, STH 4.8432, STH 4.8459, STH 4.8435, STH 4.4742, STH 4.4586, STH 4.4606, and STH 4.4690. Maize (Zea mays L.) cultivar Waza was used as a pollen donor. Oat and maize plants were grown in a greenhouse under 16-h photoperiod and 21/17°C day/night temperature. Natural light was supplemented with sodium lamps on cloudy days, if necessary. Oat flowers were emasculated and after 2 d pollinated with maize pollen. Pollinated flowers were treated with one drop of 2,4-dichorophenoxyacetic acid (2,4-D) solution (50 mg dm−3) on the next day. The protocol of the wide crossing method for the production of oat doubled haploids (DH) has been previously described in details by Skrzypek et al. (2016), Warchoł et al. (2016), and Nowakowska et al. (2015). Enlarged oat ovaries were collected 21 d after pollination with maize. They were surface-sterilized in 70% ethanol (1 min), 2.5% calcium hypochlorite (7 min) and washed four times with sterile water. All ovaries were opened aseptically and haploid embryos were isolated under the light microscope SE-222 R (Eduko, Warsaw, Poland). The embryos were placed in 6-mm Petri dishes with 190–2 medium (Zhuang and Xu 1983) for germination and conversion into haploid plants. Regenerants were passaged individually to Magenta vessels with MS medium (Murashige and Skoog 1962). Then the plants were acclimated to the ex vitro conditions. Doubling the number of chromosomes was done using colchicine and the plant ploidy was assessed by MACS Quant flow cytometer (Miltenyi Biotec GmbH, Begisch Gladbach, Germany) as described by Skrzypek et al. (2018). The whole opened ovaries used for hormonal analysis were divided into two groups: (1) ovaries, in which embryos developed (OE), and (2) ovaries, in which embryos did not develop (OWE). Each group of ovaries from individual genotypes were collected together. It means that hormonal analysis was carried out for pooled samples that consisted of at least 13 ovaries collected from individual genotype. Data from each genotype was counted as replicates and used to calculate means and standard error (SE). Lyophilised ovaries were pulverized in a mixing mill (MM 400, Retach, Kroll, Germany) and 25 mg of dried ovaries was used for hormonal analyses. Extraction and quantification of phytohormones were carried out according to Dziurka et al. (2016). Samples spiked with stable isotope labeled internal standards were extracted using the methanol/water/formic acid mixture (MeOH/H2O/HCOOH, 15/4/1 v/v) (Dobrev and Kaminek 2002). Extraction was repeated twice and combined extracts were evaporated under nitrogen and re-suspended in 5% MeOH in 1 M HCOOH and purified on SPE cartridges (BondElut Plexa PCX, 30 mg, 1 mm, Agilent, Santa Clara, CA). The fraction containing abscisic acid (ABA), auxins, gibberellins, jasmonic acid (JA), and salicylic acid (SA) was combined with cytokinins and evaporated under N2, reconstituted in 70 μl of acetonitrile (ACN), filtered (0.22-μm nylon membrane), and used for ultra-high performance liquid chromatography (UHPLC) analyses. The system consisted of UHPLC (Agilent Infinity 1260, Agilent, Woldbrom, Germany) and a triple quadruple mass spectrometer (Agilent 6410, Agilent, Santa Clara, CA) with electro-spray ionization (ESI). Separation was achieved on an AscentisExpres RP-Amide analytical column (2.7 μm, 2.1 mm × 75 mm; Supelco, Belefonta, PA) at linear gradient of water vs. ACN both with 0.01% HCOOH. The following hormones were monitored: trans-zeatin (tZ) and cis-zeatin (Z), [15N4]dihydrozeatin (DHZ-N15, used as internal standard (ISTD)), kinetin (KN) and [15N4]kinetin (K-N15, ISTD), gibberellin A1 (GA1), gibberellic acid (GA3), [2H2]gibberellic acid (GA3-D2, ISTD), gibberellin A6 (GA6), [2H5]indole-3-acetic acid (IAA-D5, used as ISTD) and indole-3-acetic acid (IAA), [2H4]salicylic acid (SA-D4, used as ISTD), salicylic acid (SA), [2H6]cis,trans-abscisic acid (ABA-D6, ISTD), cis,trans-abscisic acid (ABA) and indolebutyric acid (IBA), jasmonic acid (JA), and gibberellin A4 (GA4). Multiple reactions monitoring (MRM) transitions were used to identify and quantify all compounds of interest (Supplementary Table 1). Calibration was performed based on calibration curves of pure standards, taking into account the recovery of stable isotope labeled ISTDs. All standards were purchased from OlChemim (Olomouc, Czech Republic) at the highest available purity, whereas all solvents were of HPLC grade and were purchased from Sigma-Aldrich (Sigma-Aldrich, Darmstadt, Germany). Data were analyzed using the statistical package STATISTICA 12 (Stat-Soft, Inco., Tulsa, OK). The Student’s t test at p ≤ 0.05 and p ≤ 0.001 was used to determine the significance of differences between phytohormone contents in OE and OWE. Hormone contents measured in OE of each genotype were correlated to their performances in DH line generation and analyzed at 0.05 and 0.01 probability level. Correlations between endogenous phytohormones in OE and OWE were analyzed at 0.05 and 0.01 probability levels. A total of 5794 flowers from 8 genotypes were emasculated (Table 1). Three-hundred and forty-six haploid embryos occurred, which corresponded to 5.7% efficiency counted per 100 florets. Nearly half of the obtained embryos germinated. The germination rate of haploid embryos varied between genotypes from 0.4% (STH 4.4729) to 5.7% (STH 4.4690) and the mean value was 2.2%. One-hundred-nineteen (1.8%) haploid plants developed in vitro. Of these, 43 (0.6%) survived acclimatization. As a result, 30 (0.4%) plants were acquired after the colchicine treatment. The individual steps of the haploidization process are shown in Fig. 1. Oat ovaries and haploid embryos obtained by wide crossing with maize: (A) 21-old ovary after pollination with maize, (B) opened ovary with haploid embryo (e), (C) non-germinating haploid embryo, (D) germinating haploid embryo, and (E) germinated haploid embryo with developed leaves (l) and root (r). Three auxins: IAA, 4-Cl-IAA, and IBA, were measured in the ovaries (Fig. 2A and Supplementary Table 2). About one and a half times more IAA content was noted in OE compared to OWE. Chloroindole auxin, 4-Cl-IAA, was detected in OWE, while it was not found in OE. Similar amounts of IBA were present in both types of ovaries: OE and OWE. Phytohormone contents [pmol/g D.W.]: (A) auxins, (B) cytokinins, (C) gibberellins, and (D) stress hormones (ABA, SA, JA) in the ovaries in which haploid embryo developed (OE) and in the ovaries without developed embryo (OWE). Bars represent means of 8 replicates ± SE. Stars indicate significant differences at p ≤ 0.05 (*) and p ≤ 0.001 (***). The analyses of Z, tZ, and KN were carried out in both types of the ovaries, and the results are shown in Fig. 2 B and Supplementary Table 3. There were no differences between the Z content in both types of the ovaries. On the contrary, significantly higher tZ levels (47 pmol/g DW) were recorded in OE in comparison to OWE (29.4 pmol/g DW). We also observed up to eightfold higher amounts of kinetin in OE than in OWE. The following gibberellins were determined: GA1, GA3, GA4, GA6, and GA7 (Fig. 2 C and Supplementary Table 4). In both types of the studied ovaries, GA6 was present in the highest quantities than other gibberellins. GA3 was the second gibberellin in terms of abundance in the ovaries. It was accumulated in OE in about one and a half times larger quantities compared to OWE. Gibberellins GA1, GA4, and GA7 were found in small amounts and there were no differences in their contents between OE and OWE. Figure 2 D and Supplementary Table 5 show the levels of stress hormones, such as ABA, JA, and SA in both types of the ovaries. There were no significant differences in each of them between OE and OWE; however, higher amounts of these hormones were detected in OE compared to OWE. All stress hormones were present in very high quantities in comparison to other hormones monitored. The ABA content was about 3000–4000 pmol/g DW, JA up to 8000 p/g DW, and SA approximately 5000 pmol/g DW. There was no relationship between the auxin content in oat ovaries and the haploid production efficiency (Table 2). In contrast, the presence of cytokinins: tZ and KN, in the ovaries was strongly negatively correlated with the examined characteristics. The tZ content correlated with the frequency of haploid embryo formation, germination, and haploid plants obtained in vitro. The lower kinetin content in oat ovaries increased the efficiency of doubled haploid production at all assessed stages. There were no correlations between the Z content and the studied traits. 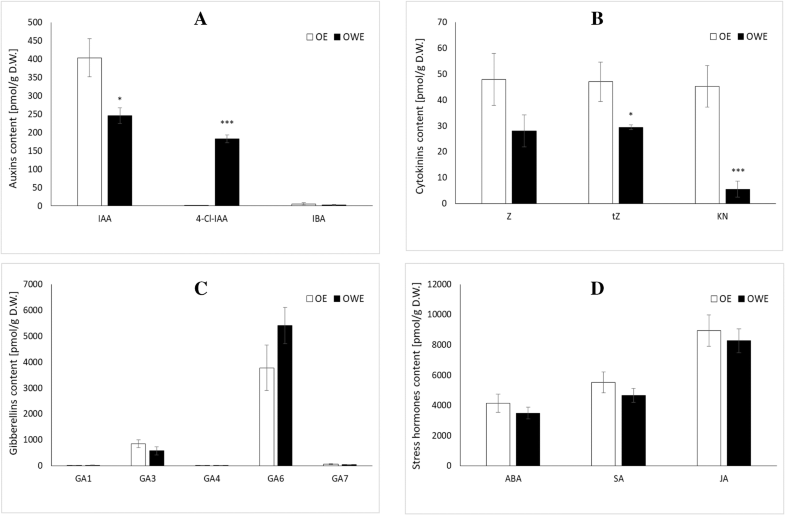 There was a significant positive correlation between GA1 level in oat ovaries and the frequency of haploid embryo formation, germination, and haploid plant development in vitro. The remaining gibberellins did not show any correlation with any of the examined traits describing the efficiency of doubled haploid production. The level of SA measured in the ovaries was positively correlated with the efficiency of DH lines. No relationship was found between ABA and JA, and parameters determining haploid production efficiency. The relationships between individual phytohormones present in OE and OWE were also examined (Tables 3 and 4). The auxin IAA showed a strong negative correlation with tZ in OWE (Table 4). While IAA positively correlated with GA6 in OE (Table 3). Furthermore, positive correlations between IBA and tZ and JA were found in OE. The tZ content was related to the KN content in both types of the ovaries. Some negative correlations between cytokinins and gibberellins were noted. tZ correlated negatively with GA3 in OWE and with GA1 in OE. In addition, KN negatively correlated with GA7 in OWE. An exceptionally strong negative correlation was observed between Z and JA in OE. Higher GA3 content was accompanied by higher GA7 content in OWE. ABA, SA, and GA4 did not show any correlation with any other phytohormones. Embryogenesis involves the interplay between endogenous hormones such as auxins, cytokinins, gibberellins, and abscisic acid. Knowing the hormonal profile during the haploid embryo development will allow to modify the rescue medium in order to increase the rate of their conversion into plants. The conversion of oat haploid embryos is the most critical stage in the production of oat DH (Lulsdorf et al.2014; Noga et al.2016; Warchoł et al.2018). Higher IAA content in OE than in OWE can suggest that IAA is involved in the process of haploid embryo development, which is in line with the knowledge about zygotic embryogenesis (Bewley et al.2013). Auxin balance plays an important role in embryo apical-basal patterning (Hadfi et al.1998; Friml 2003; Friml et al.2003; Jenik and Barton 2005; Su et al.2011). Cheng et al. (2017), in turn, reported a higher IAA content in developing hazelnut ovules compared to abortive ones. According to Slater et al. (2013), auxin was the dominant hormone present in developing zygotic seeds of chickpea, lentil, field pea, and faba bean. IBA, which is considered an IAA precursor and/or a storage form (Simon and Petrásek 2011), was found in trace amounts in both types of the ovaries. The presence of 4-Cl-IAA in OWE in the current study is surprising, because so far this auxin has not been detected in oat. Possibly 4-Cl-IAA acts as a signaling factor and might be involved in the process of senescence in oat florets. The hormonal analyses were carried out 3 wk after pollination; thus, it can be assumed that the ovaries, in which embryos did not develop, were directed towards senescence. This would be consistent with the Engvild’s hypothesis (Engvild 1989), according to which 4-Cl-IAA could be a senescence factor. The 4-Cl-IAA content is associated with lower IAA amounts in OWE (compared to OE), which may indicate that it is a degradation product of IAA, as suggested by Slater et al. (2013). All cytokinins were present at the level of several dozen pmol per g DW, which means that this group of hormones is not as significant component of the ovaries as auxins. Cytokinin accumulation in developing seeds is accompanied by intense cellular divisions (Morris 1997). According to Rijavec et al. (2011), unfertilized ovules did not accumulate cytokinins in contrast to developing maize caryopses. Similarly, Cheng et al. (2017) reported higher cytokinin content in developing ovules compared to abortive ones. The higher tZ content in OE than in OWE can be explained by cell divisions and differentiation of haploid embryo. However, a negative correlation was found between endogenous cytokinins (tZ and KN) in the ovaries and haploid embryo formation, germination as well as haploid plant production, which may indicate that the excess of cytokinins is also not favorable for embryogenesis. Particularly noteworthy is the accumulation of KN in OE. Kinetin has been regarded for many years as a substance that does not naturally occur in plants. It was until Barciszewski et al. (1996) identified KN in dried coconut. Kinetin was also found in triticale anthers and described that it acts as a DNA protective agent against reactive oxygen species (Żur et al.2014, 2015b). Considering our results, it can be suggested that that accumulation of KN in OE is associated with oxidative stress. Muller and Sheen (2008) postulated the occurrence of a crosstalk between auxins and cytokinins during early embryogenesis. Here, we showed that the correlation between IAA and tZ is altered and reversed in OE and OWE. Gibberellins, particularly GA3, is commonly used in in vitro cultures to stimulate embryo germination (y Aké et al.2007). We showed that the capacity of haploid embryos to germinate was correlated with GA1 content in the ovaries. GA6 was present in OE and OWE in amounts of approximately 5000 pmol/g DW. Endogenous GA6 was detected in Lolium temulentum as a natural stimulus of floral development (King et al.2003). Cheng et al. (2017) reported higher content of GA3 in developing hazelnut ovules compared to aborted ones. The OE were characterized by higher amounts of GA3 and GA7 gibberellins compared to the OWE, although they did not differ statistically. It is highly probable that gibberellins are involved in the development of the haploid embryo, but the mode of their action needs to be further investigated. GA1 and GA4 are considered as active forms of gibberellins in seeds (Bewley et al.2013). It was shown that embryo abortion (Cheng et al.2017) and senescence (Khan et al.2014) is strongly associated with the production of large amounts of stress hormones: ABA, JA, and SA. In our study no significant differences in stress hormones between OE and OWE may indicate that the process of ovaries aging has not been started yet. On the other hand, the accumulation of 4-Cl-IAA in OWE might be a senescence signal, whereas the higher cytokinin content in OE than in OWE can deny senescence. Taking the above into consideration, differences in hormonal levels could be a consequence of embryo development as well as senescence of ovaries. To resolve this issue, further investigation is needed. The hormonal profiles in oat ovaries as well as presence of 4-Cl-IAA were described for the first time. The higher concentration of IAA, tZ, and KN in ovaries stimulate haploid embryo development. 4-Cl-IAA was detected only in ovaries, in which embryos did not develop, what suggests its role as a senescence factor. Kinga Dziurka and Edyta Skrzypek conceived and designed the experiment; Kinga Dziurka, Marzena Warchoł, Ilona Czyczyło-Mysza, Izabela Marcińska, Angelika Noga, Kamila Kapłoniak, and Edyta Skrzypek performed the experiment; Kinga Dziurka and Michał Dziurka conducted the UHPLC analyses; Kinga Dziurka analyzed the data; and Kinga Dziurka wrote the paper. 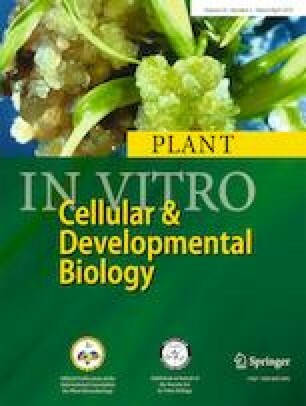 This research was funded by the National Centre for Research and Development, PBS3/B8/17/2015, and by the statutory projects of the F. Górski Institute of Plant Physiology Polish Academy of Science 5457/E-189/S/2015.